In the fall of 2013, the war between Congolese forces and rebels known as M23 culminated in a fierce battle on plains of volcanic rock in Congo’s east. For more than a year, M23—a formidable rebellion with ties to Rwanda and Uganda—had scored successive victories over the Congolese army, including the capture of Goma, the region’s most vital city. In late 2013, with enhanced support from the United Nations and the international community, the Congolese army resolved to crush the rebellion and launched one of the largest military campaigns in its recent history. For months, the army advanced on M23 positions. As it pushed the rebels farther toward the border, fighters were close enough to taunt one another across frontlines that lay in the shadows of eastern Congo’s towering mountains. In October, the army shocked the world with a surprisingly powerful and effective final offensive that ended the reign of M23. On assignment for The New York Times, I traveled to eastern Congo to cover this momentous and historic confrontation. Over the course of three months, I moved alongside Congolese forces as they battled to retake vast swaths of territory. I followed them from the frontlines outside Goma to M23’s final strongholds, deep in the mountains along the border with Uganda. During this period, I sought to capture not only newsworthy hallmarks of the war, but also the complex, human experience of all involved. I aimed to capture the chaos and the quiet, the oscillating moments of fear and exuberance and of reflection and despair. I strove to convey the tension of the war as felt by soldiers, civilians, and politicians alike, each experiencing the conflict in unique and different ways. In this sequence of pictures we see the scope and range of those experiences. We see soldiers on their knees, humbled in prayer along the frontlines. This is contrasted with images of the rowdy and intimidating nature of their advance. We see civilians scatter during a firefight in one frame and celebrate around a smoking gun in another. We see palpable tension on the faces of the Kanyabugoyi family as they huddle inside their home, unsure of what the future will bring. These images differ from previous work on this subject in their humanization of Congolese combatants and civilians alike. In many instances, soldiers in the Democratic Republic of Congo are depicted as vicious and predatory. Historically, they have been responsible for abuses against the population in the course of conflict and work from Congo has reflected this. Here, however, we see soldiers not as monsters, but as complicated individuals caught in the throes of a conflict that is larger than each one of them. Within this sequence, we see them as both victims and aggressors. When published in The New York Times, these pictures drew attention to reform efforts underway within the Congolese army and its new commitment to eliminate the presence of armed groups in the country’s vacuous east. Power struggles between the region’s many armed groups have caused terror and chaos for the population for decades. These pictures illustrate the army’s most significant effort to pacify such armed groups, and capture its first momentous victory. Congolese civilians scatter during a burst of heavy machine gun fire as FARDC troops advance toward Bunagana. Congolese soldiers return from the frontline at Kibumba, outside Goma. General Bahuma Ambamba, the commanding officer of all FARDC forces in eastern Congo's North Kivu Province, sits with his personal guards inside the FARDC command center in Munigi, outside Goma. General Bahuma was brought into command following the fall of Goma last year to M-23 rebels. 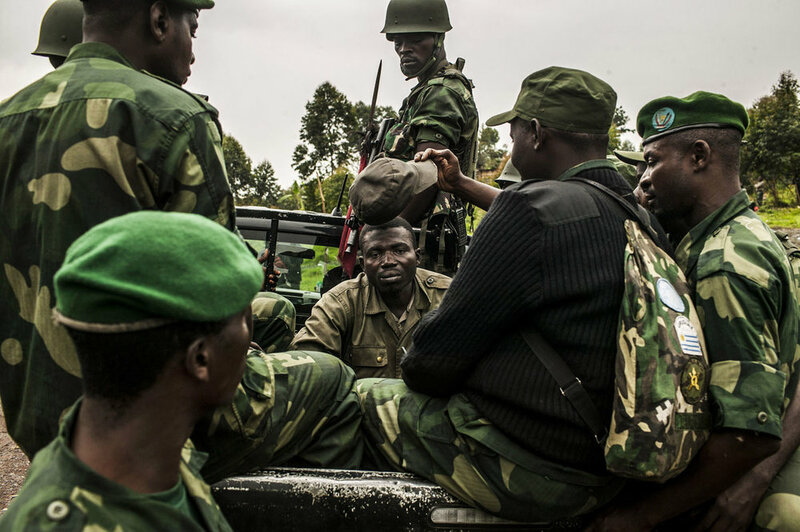 Beyond suppressing the M-23 rebellion, which is the largest and most threatening rebellion in eastern Congo at the moment, Bahuma also has ambitions of reforming the way in which the FARDC functions. Congolese soldiers jog through downtown Goma on a Saturday morning. The weekly jogs are a relatively new feature, designed to inspire confidence and patriotism in the city's residents. A Congolese military chaplain prays with soldiers at the frontline in Kibumba, outside Goma. This position is the furthest advance point of the military. Members of the M-23 rebel group are within shouting distance. Congolese soldiers celebrate as they advance up the mountainous road toward Bunagana, the last remaining stronghold of the M-23 rebels on Wednesday. Congolese forces rest before an offensive to dislodge remaining elements of the M23 rebel group in the hills outside Kibumba, north of Goma. Feller Rutahichura, the Vice Governor of North Kivu state, speaks with community members in the village of Ittebero, in Walikale Province. With assistance from the humanitarian organization, CARITAS, the Congolese government and the UN have brokered an arrangement whereby two notorious armed groups operating around Ittebero have agreed to lay down their arms. The agreement is part of a wider effort by the government and the UN to confront armed groups. Civilians chop down sugar cane to pass along to Congolese soldiers as they advance up the mountainous road toward Bunagana, the last remaining stronghold of the M-23 rebels on Wednesday. A surrendered rebel from the M-23 rebellion (center, seated) is transported by members of the FARDC from the frontline near the village of Kibati, north of Goma. Congolese soldiers inspect munitions abandoned by M23 rebels at a former M-23 military base in Rumangabo, north of Goma. With heavy guns still smoking, residents of the town of Bunagana, celebrate the routing of M-23 rebels by the Congolese army. Congolese soldiers rest behind the frontline with M-23 rebels behind the frontline north of Goma. Congolese children play on a destroyed M-23 tank near Kibumba, north of Goma on Tuesday. Kibumba was the site of heavy fighting between the Congolese army and M-23 rebels on Sunday.